PAWS HAS BOUGHT LAND FOR OUR FUTURE ANIMAL PROTECTION SHELTER!!! ﻿﻿﻿We are excited to announce that we closed on 3.56 acres of properly zoned land in Flint Township May 14, 2015 and will be actively preparing the site for our future shelter. Please email Roxanne at rbeckwith1@outlook.com or Melissa at mmzm2329@aol.com if you are interested in learning about how you can help us with this exciting endeavor. We are selling T-shirts featuring some of our PAWS dogs and cats for a $20 donation that goes into the "Woof" building fund. Contact Melissa at mmzm2329@aol.com if you are interested in supporting our building fund. 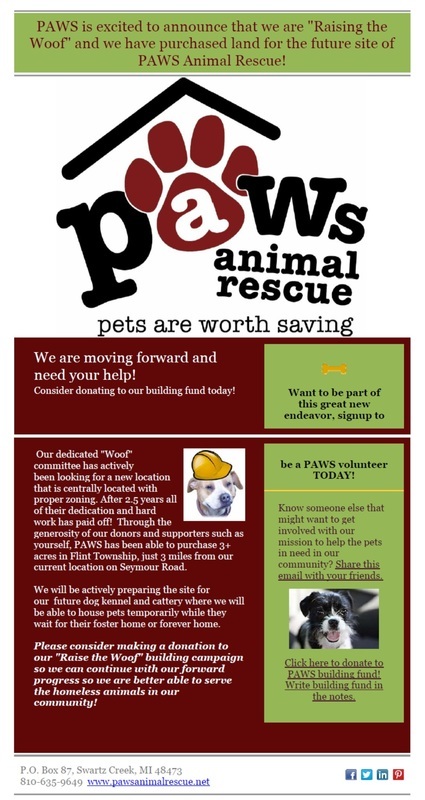 Earn money for PAWS while you walk - Download the app today! Visit WoofTrax.com to get the "Walk for a Dog" app and start walking for your rescue! Some of our cats are in need of some dental care and PAWS has a semi-annual bottle/can drive to help pay for those expenses. So far we have raised enough to cover the cost for several cleanings and other needed feline dental care. We have more cats to do. You can drop off your returnable cans and bottles at our drop off bin located at 4114 Seymour Road in Swartz Creek. Or you can contact Swartz Creek Veterinary to make a direct donation to the care of our felines in need . Help PAWS with Kroger Community Reward Points. Then choose Kroger Community Rewards #90830 (PAWS RESCUE SWARTZ CREEK MI). Our animals will benefit each time you shop at Kroger and use your Kroger card. Rewards expire every year in April, so be sure to check your account to RENEW YEARLY. PAWS benefits when you shop AmazonSmile. You can manage your purchases and other account information on Amazon.com and AmazonSmile using a single account. You can use your existing Amazon.com account on AmazonSmile if you have one, or create a new account if you don’t. On your first visit to AmazonSmile, you will be prompted to select a charitable organization to receive donations from eligible purchases before you begin shopping. We will remember your selection, and then every eligible purchase you make on AmazonSmile will result in a donation. ***Please choose "PAWS RESCUE" and look for the one in Swartz Creek as there are more PAWS Rescues listed.